Editor’s note: I’m blogging this week (again) from Cincinnati, where I’m attending to some unexpected family business. I hope to soon be back in L.A. assuming I don’t tumble into a giant pothole or drown in a four-way. Pasadena Mayor Bill Bogaard says that he believes that a tunnel to close the 710 gap is still under consideration despite the announcement last week that the draft environmental study for the project will be delayed to accommodate new computer modeling. The mayor has in the past said that he’s against a tunnel. Other alternatives under consideration include light rail, bus rapid transit, intersection and traffic signal improvements and no build. The headline could have easily been 11 common sense things to do to speed up buses. Among the suggestions: moving stops to the far sides of intersections (so buses don’t stop twice — once for passengers and again for a red light), consolidating stops, streamlining routes, using more bus lanes and using more traffic signal priority. It’s a smart post and I hope that it’s read by the many cities that are served by Metro and muni buses in Los Angeles County — as they have a big say in this. Bottom line: don’t stand on the yellow line at the edge of the platform, even if you’re deemed an important person. One idea: the “Earthroamer” a 10-ton RV complete with its own array of solar panels that probably don’t help prevent it from being a greenhouse gas machine. An attempt to stop the city’s streetcar project failed. The new enemy of the public: a proposed bike lane in downtown on Central Parkway, which could rob businesses of free employee parking, so says Cincinnati’s mayor. Semi-irony: Spending money on the bike lane was previously approved and underneath Central Parkway is a subway that was partially built in the 1920s but never completed. Construction of a streetcar along the Parkway was halted and almost suspended last winter but work has resumed. Hey Cincy: try finishing what you started! 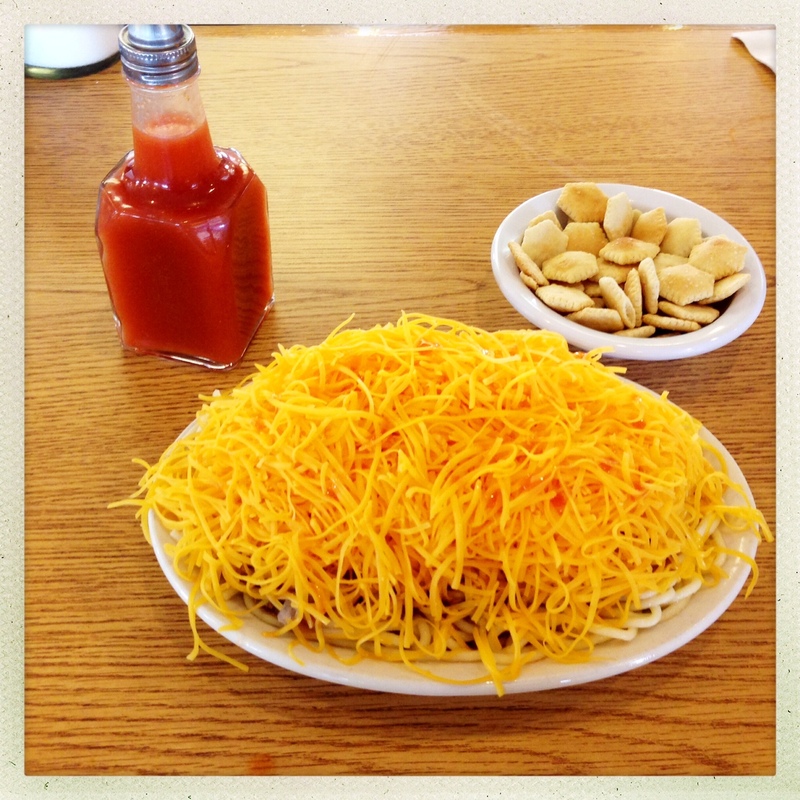 Not really related but for those who didn’t understand the above reference, below is what a “four-way” plate of Cincy chili looks like. Four way as in cheese on top of chili, onions and spaghetti. Chili John’s on Burbank Boulevard and Keystone in Burbank serves a very similar and tasty dish and Metro’s 154 bus stops right in front for the culinarily curious and adventurous. What, did you all expect “lead by example” is a common sense notion that politicians have? Why would you WANT to spend $10k per day roaming the west? The only kind of RV I’d ever want to own would be the kind that’s typically 85 feet long, has 8-12 wheels, but no engine, and if you want to go anywhere with it, you call Amtrak. If Metro recommends a “no-build” on the 710 project, where does the money go? Measure R suggests that the funds need to stay in the same general area, but who gets to draw those lines? Steve, is that Skyline Chili?